Solves linear systems using the Jacobi and Gauss-Seidel Iterative Techniques. 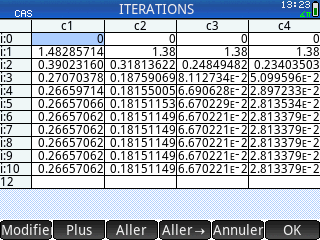 It also calculates the spectral radius of the iteration matrix. 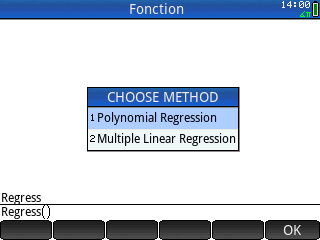 Allows you to perform Polynomial Regression and Multiple Linear Regression using the Least Squares technique. CAS program that solves an equation using the Modified Newton-Raphson Iterative Technique. 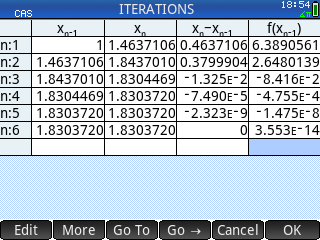 CAS program which solves nonlinear systems using the Newton Method. 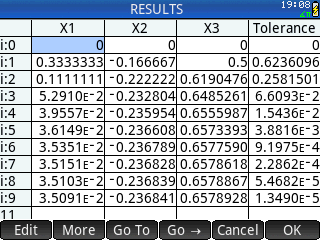 It also calculates the Jacobian matrix of the system of equations. 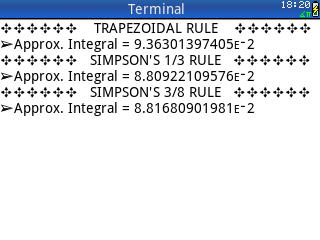 Approximates the definite integral for a given function using the Newton-Cotes Formulas (Trapezoidal Rule, Simpson 1/3 Rule and Simpson 3/8 Rule) and Gauss-Legendre Quadrature.